The Time Machine service in Yosemite Server hasn’t changed much from the service in previous operating systems. 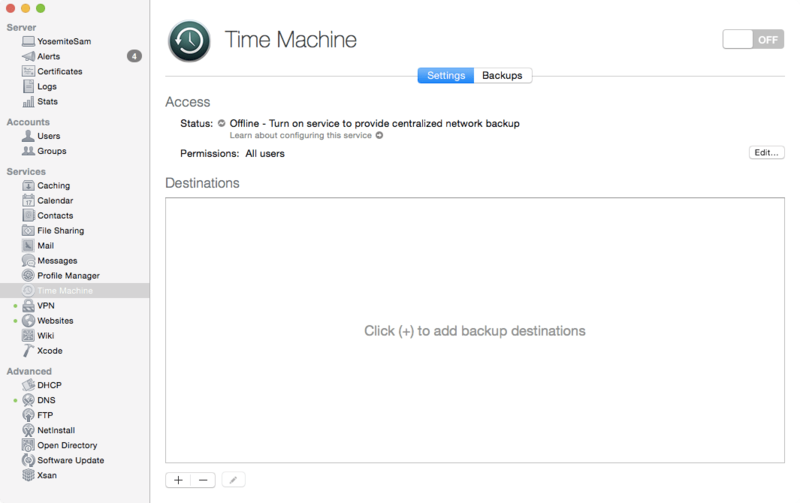 To enable the Time Machine service, open the Server app, click on Time Machine in the SERVICES sidebar. If the service hasn’t been enabled to date, the ON/OFF switch will be in the OFF position and no “Backup destination” will be shown in the Settings pane. 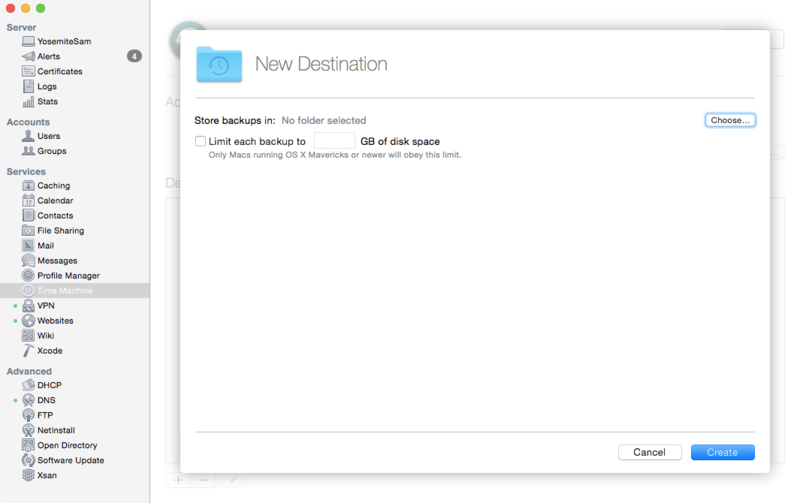 Click on the ON button to see the New Destination screen, used to configure a list of volumes as a destinations for Time Machine backups. The selection volume should be large enough to have space for all of the users that can potentially use the Time Machine service hosted on the server. When you click the Choose button, a list of volumes appears in a standard Finder selection screen. Here, click on the volume to save your backups to in the sidebar. In most cases the Backup destination will be a mass storage device and not the boot volume of the computer. Once selected, click Choose and then if desired, limit the amount of storage on the volume to be used for backups. Click Create and a share called Backups is created and the service will start. Don’t touch anything until the service starts. Once started, add a backup destination at any time using the plus sign button (“+”) and defining another destination. Time Machine Server works via Bonjour. 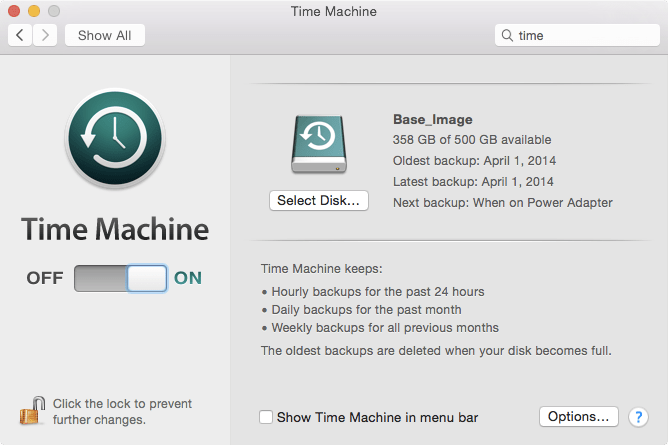 Open the Time Machine System Preference pane and then click on the Select Backup Disk button from a client to see the server in the list of available targets, much as you would do with an Apple Time Capsule. Under the hood, a backup share is creating in the file sharing service. To see the attributes of this share, use the serveradmin command followed by the settings option and then the sharing:sharePointList:_array_id:, so for a path of /Volumes/New Volume 1/Shared Items/Backups use: sudo serveradmin settings sharing:sharePointList:_array_id:/Volumes/New Volume 1/Shared Items/Backups The output indicates the options configured for the share, including how locking is handled, guest access disabled, generated identifiers and the protocols the backups share listens as: sharing:sharePointList:_array_id:/Volumes/New Volume 1/Shared Items/Backups:name = "Backups"
sharing:sharePointList:_array_id:/Volumes/New Volume 1/Shared Items/Backups:smbName = "Backups"
sharing:sharePointList:_array_id:/Volumes/New Volume 1/Shared Items/Backups:dsAttrTypeNative\:sharepoint_group_id = "F4610C2C-70CD-47CF-A75B-3BAFB26D9EF3"
sharing:sharePointList:_array_id:/Volumes/New Volume 1/Shared Items/Backups:mountedOnPath = "/Volumes/New Volume 1"
sharing:sharePointList:_array_id:/Volumes/New Volume 1/Shared Items/Backups:dsAttrTypeStandard\:GeneratedUID = "FAB13586-2A2A-4DB2-97C7-FDD2D747A0CD"
sharing:sharePointList:_array_id:/Volumes/New Volume 1/Shared Items/Backups:path = "/Volumes/New Volume 1/Shared Items/Backups"
sharing:sharePointList:_array_id:/Volumes/New Volume 1/Shared Items/Backups:afpName = "Backups"
sharing:sharePointList:_array_id:/Volumes/New Volume 1/Shared Items/Backups:smbDirectoryMask = "755"
sharing:sharePointList:_array_id:/Volumes/New Volume 1/Shared Items/Backups:smbCreateMask = "644"
sharing:sharePointList:_array_id:/Volumes/New Volume 1/Shared Items/Backups:ftpName = "Backups"
} There’s also a Bonjour service published that announces to other clients on the same subnet that the server can be used as a backup destination (the same technology used in a Time Capsule). One major update from back in Mavericks Server is the addition of the timemachine service in the severadmin command line interface. To see the command line settings for Time Machine: sudo serveradmin settings timemachine The output shows that share info is displayed as with the sharing service, but you can also see the GUID assigned to each share that is a part of the backup pool of storage: timemachine:sharePointList:_array_id:/Volumes/New Volume 1/Shared Items/Backups:dsAttrTypeStandard\:GeneratedUID = "FAB13586-2A2A-4DB2-97C7-FDD2D747A0CD"
timemachine:sharePointList:_array_id:/Volumes/New Volume 1/Shared Items/Backups:smbName = "Backups"
timemachine:sharePointList:_array_id:/Volumes/New Volume 1/Shared Items/Backups:smbDirectoryMask = "755"
timemachine:sharePointList:_array_id:/Volumes/New Volume 1/Shared Items/Backups:afpName = "Backups"
timemachine:sharePointList:_array_id:/Volumes/New Volume 1/Shared Items/Backups:smbCreateMask = "644"
timemachine:sharePointList:_array_id:/Volumes/New Volume 1/Shared Items/Backups:path = "/Volumes/New Volume 1/Shared Items/Backups"
timemachine:sharePointList:_array_id:/Volumes/New Volume 1/Shared Items/Backups:name = "Backups"
timemachine:sharePointList:_array_id:/Volumes/New Volume 1/Shared Items/Backups:ftpName = "Backups"
timemachine:sharePointList:_array_id:/Volumes/New Volume 1/Shared Items/Backups:timeMachineBackupUUID = "844A1C43-61C9-4F99-91DE-C105EA95BD45"
timemachine:sharePointList:_array_id:/Volumes/New Volume 1/Shared Items/Backups:dsAttrTypeNative\:sharepoint_group_id = "F4610C2C-70CD-47CF-A75B-3BAFB26D9EF3"
timemachine:sharePointList:_array_id:/Volumes/New Volume 1/Shared Items/Backups:mountedOnPath = "/Volumes/New Volume 1" Additionally you can also query for the service to verify it’s running using full status: sudo serveradmin fullstatus timemachine Which outputs something similar to the following: timemachine:command = "getState"
timemachine:state = "RUNNING" While I found plenty to ramble on about in this article, Mass deployment is still the same, as is client side configuration.